In the middle of the 19th century, weeding their collections and archives, the Music School at Oxford, chose to keep portraits of, in their view, fusty old composers, but they threw out such things as a lute belonging to one of those same musicians. As a result we have a portrait of William Lawes, looking every inch a Cavalier, but the particular sound of the instrument he may have played is lost. No such cavalier treatment was handed out at Friday’s concert which was chiefly devoted to the songs of William Lawes and his older brother Henry by the French instrumental group, La Rêveuse, and singer Jeffrey Thompson. At first sight this is a wildly disparate partnership. 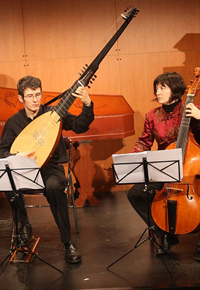 Florence Bolton on viola da gamba, Bertrand Cuiller, harpsichord, and Benjamin Perrot, theorbo, play together with precision and intensity. The lines are clear, beautifully detailed and articulated and the sound is a heady mixture of extreme virtuosity and bold exploration well-contained within a grounded musical sensibility. This group’s mastery of improvisation and realisation of a figured bass is constantly fascinating and drives the music forward. The program consisted mainly of songs by Henry and William Lawes and some of their contemporaries interspersed with purely instrumental pieces. The Lawes brothers were first employed at the court of King Charles I whose musical tastes were as cultivated as his political instincts were obtuse. Fighting for the King, William was killed in battle. Henry found a patron during the Protectorate and returned to Court under Charles II and worked also in the theatre. The texts are all about love, mostly unrequited, addressed to an imaginary Celia or Chloris and they appear somewhat light-weight and detached in effect. 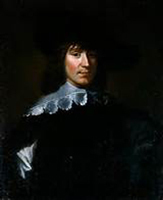 But poets such as Suckling, Carew and Herrick were writing for an intimate milieu, and on closer examination their works can be seen to be finely-polished verbal miniatures. The music supports the words, upholds the meanings and brings out the inherent drama and emotion. The slighter and more self-indulgent poems brought out Thompson’s dramatic instincts most extravagantly, including a penchant for humour. But he can also express much deeper feelings. His diction is clear, his ornaments varied and imaginative, he has fine control of dynamics and well-judged phrasing. It is with this powerful technique plus an overall level of musicianship that he meets and matches La Rêveuse. Lanier’s “No more shall meads be decked with flowers and two songs by Henry Lawes’ “Slide soft you silver floods” and especially “Have you e’er seen the morning sun” were standouts..
Three of the four instrumental pieces were Grounds, variations over a repeated pattern. These were captivating. The virtuosity of each player was remarkable. Florence Bolton’s voluptuous tone and flying fingers, Benjamin Perrot’s delicate, scintillating touch and Bertrand Cuiller’s fluid playing explored the intricacies of this extravagant, demanding form with flair and grace. The fourth selection was a pair of dance tunes, the latter one a joyous, thoroughly toe-tapping reel.